"This video presentation of John Bowlby was recorded in London, England in 1984. 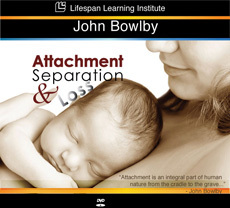 Almost two decades after developing his theory, John Bowlby, is now considered the father of the attachment theory. Bowlby's research has since been extensively studied by others and his ideas and beliefs have been confirmed. He examines the processes that take place in attachment and separation. Bowlby shows that human attachment is an instinctive response to the need for protection against predators, and one as important for survival as nutrition and reproduction. Although Bowlby was primarily focused on understanding the nature of the infant-caregiver relationship, he believed that attachment characterized human experience from "the cradle to the grave". 1. Discuss the significance of development pathways and deviations. 2. Distinguish between secure attachment and anxious attachment. 3. Explain the effects early childhood relationships with the primary caregiver on adult interpersonal relationships. 4. Discuss practical applications of attachment theory.